The aircraft, operating on a flight for the Sri Lankan Air Force to Colombo, took off from Palaly AFB in heavy rain. On climb out the engine no 2 caught fire and the crew had to return. On its final approach and 200m short of the runway, the right wing failed and the aircraft crashed. According to reports the engine caught fire after being hit by a SAM missile fired by LTTE. 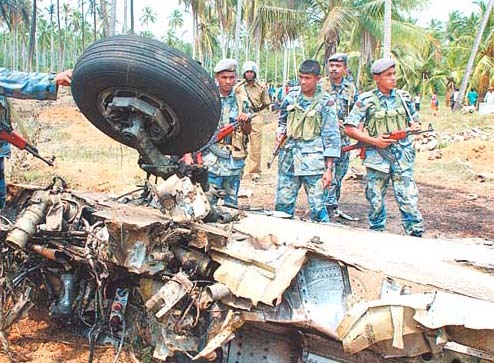 When descending through 3000ft towards Palaly AFB after a flight from Anuradhapura, the HS-748 was shot down with a SAM missile by Tamil separatists. The day before Helitours' other HS-748 had been shot down by Tiger terrorists. Instrument problems forced the crew to return to Colombo-Ratmalana. The Aircraft lost its control and crashed into the sea. While on finals to Palaly Air Force Base, the aircraft was shot down by 'Liberation Tigers of Tamil Eelam ' terrorists claimed responsibility. Around 1720H while approaching Palaly Airport the aircraft crashed into the sea, shortly after the pilot had asked the runway lights to be switched on. The aircraft crashed into the sea whilst investigating a ship on the northeastern coast of Sri Lanka. The aircraft overran the runway while on take-off for Palaly and crashed into a marshy land. Lion Air Flight 602 departed Palaly Air Force Base for a 65-minte flight to Colombo at 13.40h. The plane disappeared from radar screens while climbing to FL140, just after the pilot had reported depressurization. All the reports indicated that the plane was shot down by TTTE terrorists. The aircraft had attempted ILS Runway 04 approaches and was making an attempt to land on Runway 22 when it crashed due to fuel starvation. Reports showed the crew had reported engine trouble 10 minutes before it crashed. 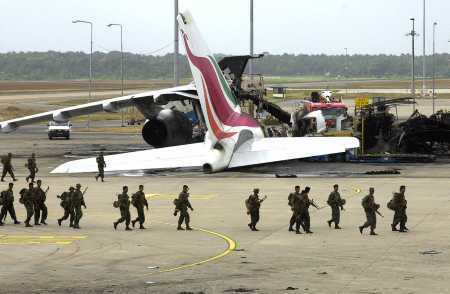 A major pre-dawn suicide attack by Tiger terrorists closed Sri Lanka's Colombo international airport. 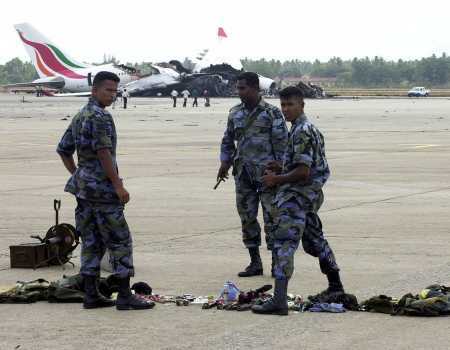 Sri Lankan Airlines reported that two of its A.330 planes (4R-ALE and 4R-ALF), one A.320 plane (4R-ABA) and one of their A.340 planes (4R-ADD) were destroyed in the attack and two others were damaged (A.340 4R-ADC and A.320 4R-ABB). A number of military planes were also damaged and destroyed. A Israeli-built Kfir aircraft belonging to Sri Lanka Air Force had exploded about 1400 ft. above Nakkawatte, Narammala in Kuliyapitiya. The remnants of the aircraft had caught fire and had fallen on to the ground. Air Flight Lieutenant had escaped activating the emergency parachute extrication. The parachute had landed on a coconut tree along with the flight lieutenant. According to initial investigations this plane was used for flight training. The flights were taken off from the Katunayake airport at 8.32. It was observed that ill-fated aircraft pilot's communication was not responded by ATCs on duty for 30 seconds. The second communication from the pilot about the mechanical failure was responded by ATC after 12 seconds and by the time aircraft was on its way to tragedy. 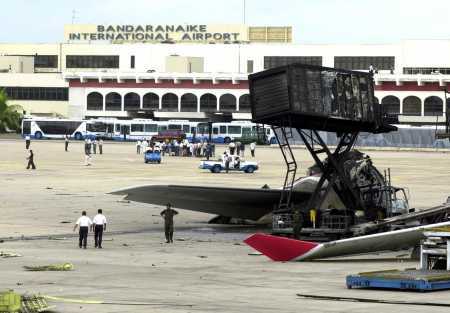 Remarks: security sources in Jaffna, Sri Lanka Air Force's AN-32 aircraft carrying 55 soldiers from Colombo Ratmalana airport to Palaly airport in Jaffna veered off the runway during landing and crashed into a nearby a signpost, injuring one soldier. Remarks: The IL-18 aircraft, registered under EX-005 in the Kyrgyz Republic and operated by Phoenix Aviation, a Sharjah based carrier, was on a flight to Colombo from Dubai. The aircraft was used by ExpoAir for operation of international cargo flights on charter basis. It carried out an emergency belly landing at BIA on 4th Wednesday at 2220 hrs after the nose wheels failed to open, damaging 12 runway lights and three taxiway lights. The seven crew members were unhurt. The crew felt the nose gear had sustained damage and was not usable for landing. Therefore they had decided to carry out the landing without the extended nose gear, after declaring an emergency. The aircraft has first touched on the grass patch on the right side of the runway - 04 (lagoon-end) between taxiway Echo and Delta and moved forward with the belly touching ground. During this run, two engines on the left wing of the aircraft and the belly of the aircraft have been seriously damaged. There is no major surface damage to the runway. They said though the crash landing damaged some runway lights, it did not make the plane catch fire as it came to rest in the middle of the runway in one piece. A Sri Lanka Air Force MiG-27 swing-wing fighter jet crashed into the Negombo lagoon shortly after takeoff from the Katunayaka Air Force base. The pilot, Flight Lieutenant, ejected seconds before the crash. 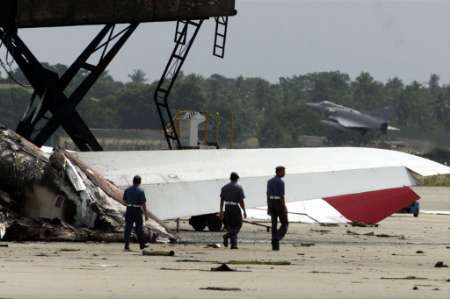 The pilot who had sensed engine failure following a crackling noise, had communicated with a MiG-23 pilot who had instructed him to steer the jet to a safe zone and eject, the Commander said. The fighter jet was at an altitude of 1300 meters when the pilot reported the engine vibration. The Ukraine made MiG-27 was added to the Air Force fleet in 2000. 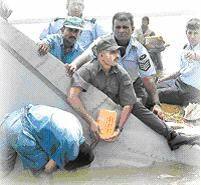 Air force fighter jet crashed into a Negombo lagoon, but the pilot managed to eject safely.